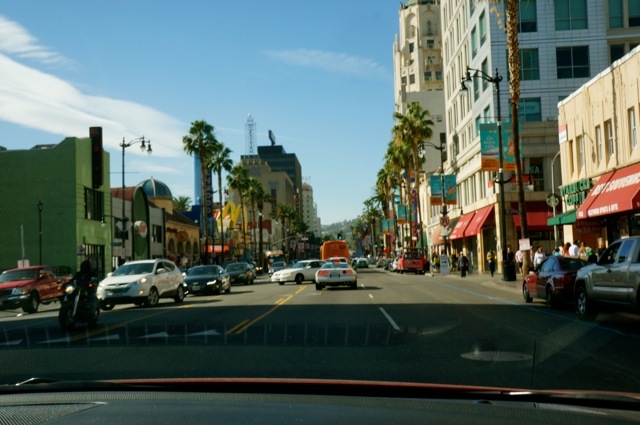 As we drive down Hollywood Boulevard, Highland Avenue comes into view and soon we are passing the El Capitan, Grauman’s Chinese and Dolby Theatres, and the streets seemingly swim with the famed sites of Hollywood lore. It’s a fall day in Southern California, a place where autumn brings not fall leaves and cool temperatures, but rather day after day of clear sunny skies and 70 degree weather. 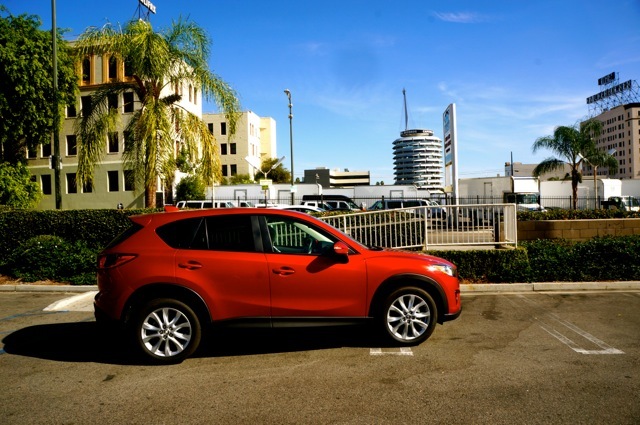 My mom and I are cruising the streets in the 2015 Mazda CX-5, and, through the large front windshield, the colors of Hollywood pop out at me – the cherry red of the carpet paving the way to Madame Tussaud’s, the gold outline of the stars on the Hollywood Walk of Fame as names like Marilyn Monroe, Michael Jackson and Mickey Mouse flash by, the green, blue and pink of the costumed characters standing in lines, posing for photos and tips. I’ve been to SoCal enough times in my life to know the reality of Hollywood is not all glitz and glamour – no movie stars actually live here, and at night the city scene is a far cry from the classy images spread during award show season. But in the daylight, from behind the clear windows of the Madza CX-5, everything looks as bright and beautiful as it does in the movies, and I allow myself to sink into the fantasy. The Mazda CX-5 is a crossover SUV. 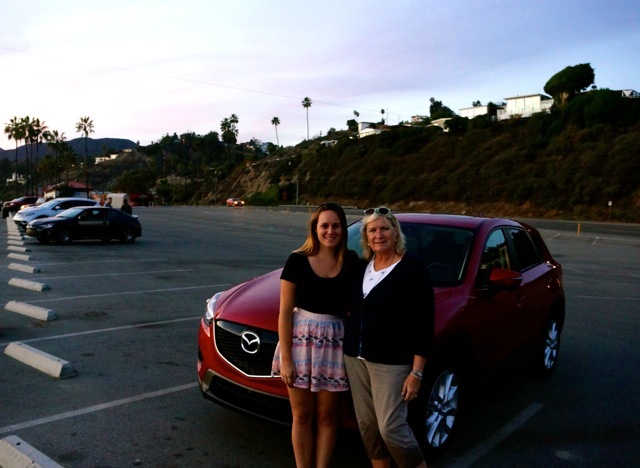 My mom and I had a chance to drive the 2015 CX-5 Grand Touring FWD model during our recent visit to Los Angeles. Indeed, the visibility offered by the vehicle was one of my favorite things about it, and my mom agreed. My mom, the primary driver during the trip, also expressed her satisfaction with how easy the SUV is to drive. With front-wheel drive, electric power assisted steering and a 184 horsepower engine, driving the vehicle is a smooth experience. A rearview camera made backing up and parallel parking much easier to maneuver, and the advanced keyless entry system made starting the vehicle a breeze. The vehicle is also extremely comfortable. The eight-way power driver’s seat allows the driver to manually adjust the seating position in eight different ways for maximum comfort. The leather wrapped steering wheel makes driving more relaxing, and with five leather trimmed sport seats, all passengers will have a comfy ride. 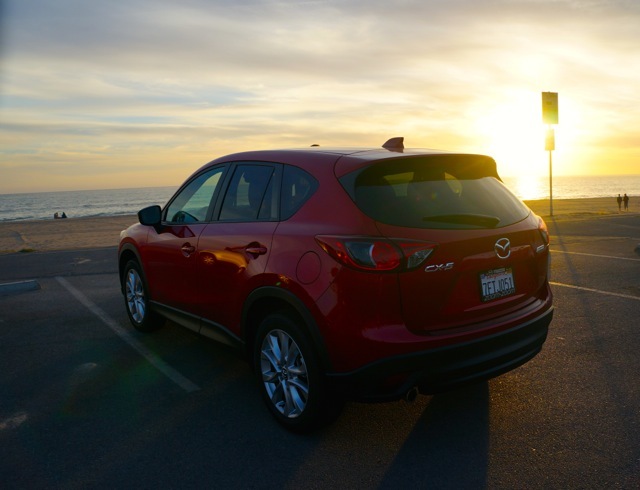 Fuel economy is a huge consideration when driving an SUV, and the Mazda CX-5 has an excellent rating of seven. The MPG is 25 for city driving and 32 for highway driving. With this vehicle you can save $1,250 in fuel costs over five years compared to the average new vehicle. Another top concern when choosing a vehicle is safety. The Mazda CX-5 has received a long list of accolades acknowledging its safety features including being named a 2014 top safety pick by the Insurance Institute for Highway Safety. On a lighter note, the vehicle also comes equipped with many features that make driving more fun. 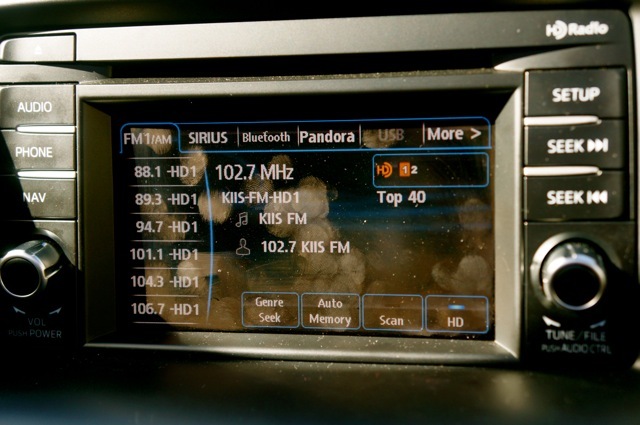 The vehicle’s power moonroof was perfect for letting the California sunshine in, and I got the chance to catch up on the latest music on the American pop scene thanks to the Sirius satellite radio. 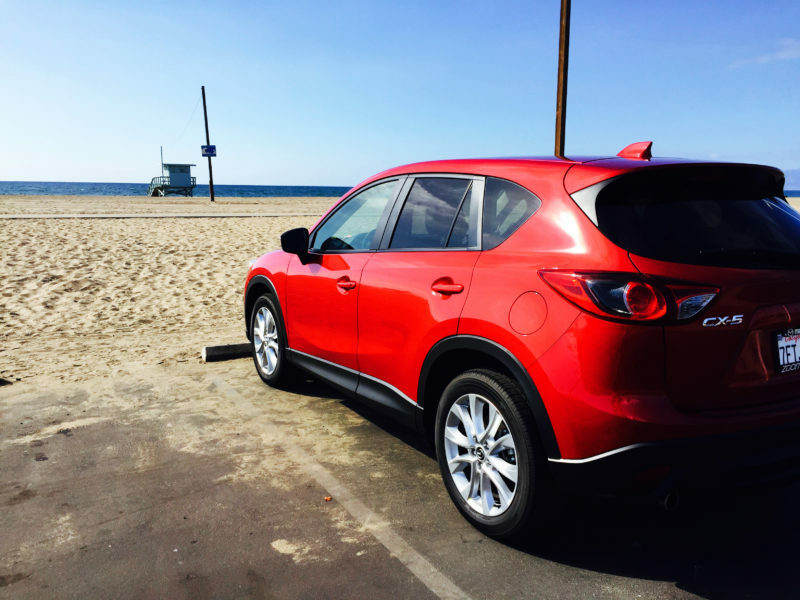 From the streets of Hollywood to sunset in Malibu, my mom and I highly enjoyed our experience in this vehicle, and we both recommend the 2015 Mazda CX-5 as a great choice for California cruising. HotelsCombined offers the best rates on hotels world-wide. Find and book accommodations for all your travel destinations in California below. 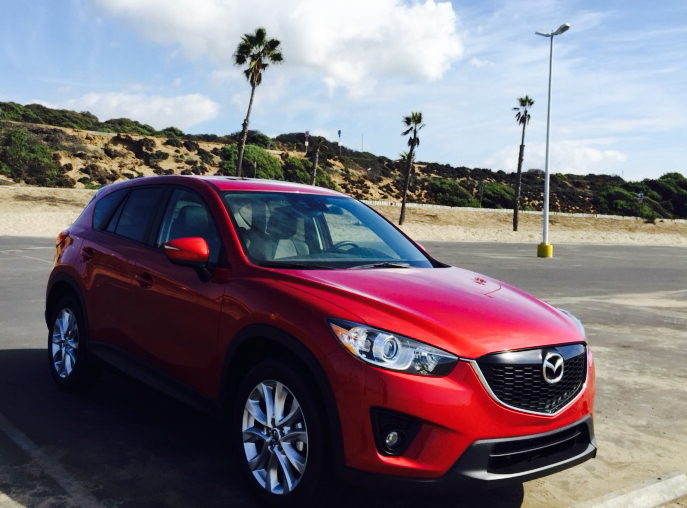 Note: I was provided with a 2015 Mazda CX-5 for review. However, all thoughts and opinions are my own. Thanks Lauren! It was a beauty to drive and I love L.A.!